Textured book, suitable from birth. Stimulating nursery novel for developing infants. 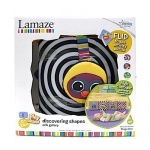 Fantastic soft toy with developmental prints to stimulate babies' minds; crinkly paper flaps for interesting noises to hear; a baby-safe mirror - babies love to discover their reflection; and ribbon ties to close or attach to pram, cot or car seat. They are simple in design yet offer a variety of ways to stimulate the senses. They appear safe and well made. Worth every penny!